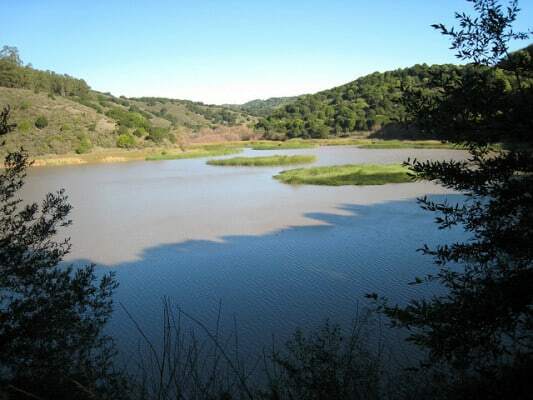 Well-known in the Oakland and San Francisco Bay area for its many miles of hiking, riding and bicycling trails, public campgrounds, and fishing on Lake Chabot at its southern end, the more than 5,000-acre Anthony Chabot Regional Park plays host in January to the annual running of California’s Brazen New Year Runs. All of the races in the event — including a 5K, a 10K and a half marathon that take runners along several of the park’s hilly, scenic hiking trails — will start and finish at the Lake Chabot Marina, which lies at the southernmost point of the lake, near both Lake Chabot Road and Fairmount Drive. From there, those running the 5K and the 10K will follow out-and-back routes; the 5K will be run entirely on paved trails, while the 10K will feature a mix of paved and natural-surface trails. The half marathon also will feature a mix of roughly 30 percent paved trails and about 70 percent dirt hiking trails, as runners in the 13.1-mile race will follow a loop course around the lake. Runners will need to be ready for the possibility of a wet-weather run and some muddy terrain through the hills around the lake, as rain is an ever-present possibility this time of year in the Oakland area. Race organizers describe the courses as wet-weather-friendly, however, which means the hills aren’t quite as challenging as some other trail races in the local area, but still provide enough of a challenge to make the race interesting. Located on the eastern side of San Francisco Bay, about a 20-minute drive south from Oakland, the city of Castro Valley lies just south of Chabot Regional Park and typically experiences cool to occasionally cold weather conditions in the early winter, as well as its wettest weather of the year on average during the month the race is held. In January, the city’s average monthly temperatures range between 54°F and 42°F, while precipitation amounts average about 5.2 inches for the month. On the day of the race (Jan. 1), the average low is 41°F and the average high is 57°F. See the Brazen New Year’s Day Half Marathon course map here. To reserve your spot in the 2020 running of Castro Valley’s Brazen New Year’s Day Half Marathon, 10K or 5K race, register online at RaceRoster.com here. Ever run in the Brazen New Year’s Day Half Marathon? Share your impressions here, or post your review in the Comments box below.